﻿♥﻿ Love Salted Caramel? 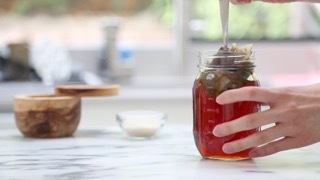 If so, you'll love my recipe for making this Bubble Tea recipe. Sea Salt is added to heavy cream and whipped together to make a light whipping cream texture. This lovely topping is then served over a black sweet tea. 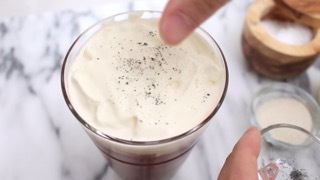 Without mixing, the whipped cream is suspended on the top of the drink, hence the name Cream Top. Before you're ready to drink, just stir together to mix the ingredients. Although boba is aways optional, I think this drink tastes good with extra boba and goodies. About the black tea: While you can use any black tea, make sure you're using your favorite black tea and brew it extra strong. 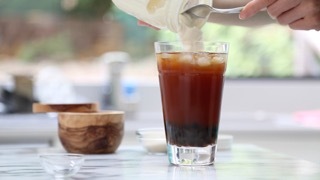 If you don't have a favorite black tea already, I recommend the PG Tips brand which works great in this bubble tea drink recipe. *Where to buy boba? Try looking for them at your local Asian grocery store. 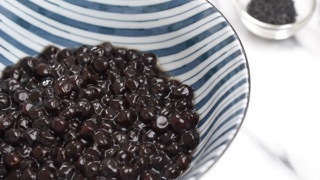 My favorite brand is Bolle brand of Boba Pearls. You can this brand online here. *Prep and cook times do not include the cooling /refrigeration of the black tea, and the boba cook time.